Havana, December 29, 1955: At the end of the meal offered at his "faithful" henchmen, Don Alessandro evokes the "business" in progress. Suddenly, the phone rang in the back room of the restaurant. The Godfather is convened to the office of President Batista. He entrusted his precious cigar box to his henchmen. It must be said that the cigar box has a false bottom, under the first layer of cigars, the box is filled with diamonds! 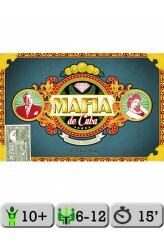 In Mafia de Cuba, each player will take the cigar box, open it and choose to: Betray and steal some diamonds, Remain a faithful and "honest" mafioso, be a driver, or act as an undercover CIA agent. In the evening, the Godfather recovers his cigar box. He blow a fuse, when he find the disappearance of diamonds. He must find his treasure an..